« How did our community survive this? BC’s capital city, in light and shadow, is the subject of a series of entertaining stories collected by Vancouver freelancer, Eve Lazarus. Engaging both as a city guide and glimpse of urban history, photographs grace almost every page, many taken by the author. Lazarus has written previously about Vancouver’s heritage houses in “At Home with History” and continues to write a lively blog on the topic at http://evelazarus.com/blog/. She brings this interest to “Sensational Victoria,” highlighting the “geneology” of Victoria’s houses and its diverse inhabitants. Emily Carr takes centre stage in the opening pages, despite the attention the artist has received in the past few decades. “She kept getting in my head,” Lazarus explains in her introduction, “and turning up in the most unlikely places.” As a result, the reader is given an introduction to Victoria “in the steps of Emily Carr.” She was born near the Parliament buildings in 1871 and now 12,000 people visit her heritage-designated home every year. Carr is featured again as one of five “legendary women of Victoria,” in the second chapter, along with writers Nellie McClung, Gwen Cash, Muriel Wylie Banchet and architect Sylvia Holland. Too bad the author left out P.K. Page (1916-2010), an acclaimed Canadian poet and the subject of a recently published biography, “Journey with No Maps”. But then artists, architects and free spirits seem to dominate this port on the edge of Canada, and a few are bound to be missed. So do sea captains and lighthouse keepers, as the next theme, ‘Tales of the Sea’ depict men shaped by the Pacific. Among them is Captain Leonard Pye Locke, in charge of the Princess Sophia. He is on the doomed ship as it returned from Alaska and on October 23, 1918, slammed into a reef during a severe storm. As gold prospectors and sailors came through the capital, so did prostitutes. Borrowing from writer Linda Eversole’s unique biography, “Stella: Unrepentant Madame”, written in 2005, Lazarus begins a chapter on Victoria’s red light district by following the Victorian-era madam’s trail of brothels. Murders, both solved and unsolved, occurring in both in hotels and homes from 1892 to 1992, chill the reader. Some of these stories have become legendary, seeping in to ghost tours and city folklore, while others are lesser-known, culled by the author from newspaper headlines. These true crimes appropriately lead to the next topic, ghost stories, for which Victoria is well-known. Local historian John Adams tells the author the city is “exceptionally” haunted because of the number of “ley lines”– invisible lines of energy that run in straight lines under the earth and create heightened spiritual and paranormal activity. The town’s warmer side returns as home owners’ pride is described in a chapter on heritage gardens. When Jim Munroe, owner of Munroe Books in downtown Victoria, bought his house in 1966, he inherited a garden framed by a stone wall and including a gazebo, pond and hundred-year old lilac. Munroe and his wife Carole went on to restore and extend this natural oasis, one of several beauty spots described in this section. “Bright Lights,” looks at the childhood homes of well-known musicians, writers and actors, including David Foster. Despite international fame as a musician and producer, Foster occasionally returns to Ascot Drive where he grew up along with six sisters, and recalls fond memories of the neighborhood. A final themed chapter called “The Limners” reflects the quirky temperament of the town. An artistic group of Victoria residents established a club of sorts in 1971, calling themselves the Limners, after itinerant sign-painters of long ago. Among them is Robin Skelton, (1925-1997) a druid-like poet and professor. He claimed his home in Oak Bay “is the very centre of my existence” and “blessed” fellow-poet Susan Musgrave’s tree house, also featured in this book, when she bought it in 1987. The author closes with a ‘stroll around downtown’ highlighting some of the historic architecture, museums and stores. Chinatown (and Fan Tan Alley) are surprisingly omitted. Inclusion of a few lesser known sites would also have strengthened the closing chapter, of an otherwise richly detailed book. Victoria is indeed a ‘sensational’ city, as the author asserts, with fascinating layers of history to appreciate. 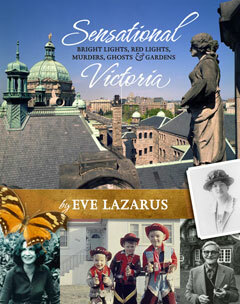 Check out Eve Lazarus’ latest book, “Sensational Vancouver,” published by Anvil Press, May 2014. This entry was posted on May 24, 2014 at 12:19 am and is filed under Book Reviews. You can follow any responses to this entry through the RSS 2.0 feed. You can leave a response, or trackback from your own site.